Green Dragon---CELESTITE opens you up to heavenly light and heightened states of consciousness! This includes the Angelic realm, connecting you to your Angels, guardians and Spirit Guides. It accelerates your growth and aids in creative expression, peace of mind, truth and clear speech. It is great for balancing your energies and promoting peace and the joy that flows from being centered. 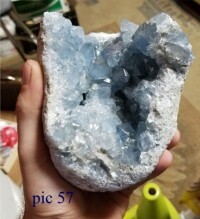 Celestite helps you with astral travel and dream recall, and its ability to clear your mind is cleansing and revitalizing, especially if you are in a stressful situation. Physically, it helps you to get rid of toxins so that you feel more vibrant. It's good for pain relief too.